Founded in 1997, the dive center Punta Dive in Cala Martina / Ibiza is successfully continued since 2016 under the name Divestar Ibiza. Beautiful sandy beaches, rocky islands with caves , wrecks and, above all, beautiful relaxed diving: Ibiza is worth a visit! We are open from the 1st of May to the 31st of October. The dive center is located on the beach of Cala Martina on the outskirts of the resort of Es Canar. Cala Martina is easy to reach on foot, by car or by bike. The beach Cala Martina is 150m long, 20m wide and well suited for children. Beach bars and Restaurants provide for the physical well-being. 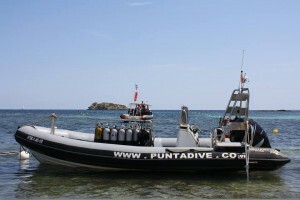 With our two fast boats we bring you to the most beautiful dive sites that Ibiza has to offer. Throughout the season, international staff is available in the center . In addition to the training possibilities, Ibiza is also a top destination for FUN diving. The weather is almost always good and the water never gets colder than 16 degrees ,in the summer to 30 degrees!. From Dado Pequeño with its exuberant life to the Cathedral (Cave) or Don Pedro. (largest wreck in Europe within the limits of recreacional scuba diving), all quickly and easily accessible from our main center. Also the "Fish Farm" Formentera is a unique dive site that should be on the list of all divers. If you have any questions or would like to speak with an employee of Divestar-Ibiza, write an e-mail to info@divestar-ibiza.com or call us on +34 971 33 67 26.